An Exemplar in GTA V.. 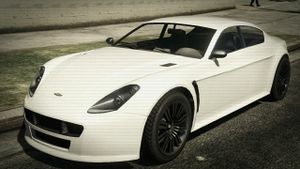 The Dewbauchee Exemplar is a sports car in Grand Theft Auto V.
The Exemplar is primarily based on the 2010—present Aston Martin Rapide while taking design influences from the Aston Martin V8 Vantage. The headlights, like with the Rapid GT and its soft top counterpart, are based on those of the Ferrari California. The Exemplar is essentially a four-door version of the Rapid GT. This page was last modified on 11 January 2015, at 02:11.